Mouse anti Human Nestin antibody, clone 10C2 used for the evaluation of nestin expression in aortic tissues by immunohistochemistry on formalin fixed paraffin embedded tissue sections. Immunohistochemistry of (g–i) NESTIN and (h–j) MCP1 in consecutive cross sections from human (g,h) coronary and (i,j) carotid artery samples. Red arrowheads depict cells that express both proteins in consecutive sections. Scale bar 100 μm. 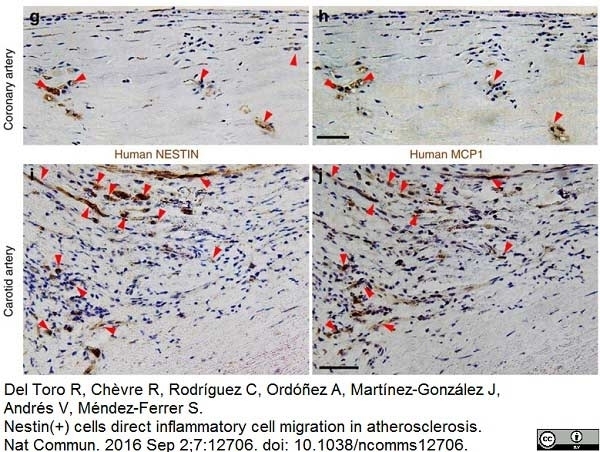 From: Del Toro R, Chèvre R, Rodríguez C, Ordóñez A, Martínez-González J, Andrés V, Méndez-Ferrer S.
Nestin(+) cells direct inflammatory cell migration in atherosclerosis. Nat Commun. 2016 Sep 2;7:12706. Creative Commons CCBY license. Mouse anti Human Nestin antibody, clone 10 C2 used for the identification of nestin expressing cells in human biopsies by immunohistochemistry on formalin fixed, paraffin embedded tissue sections. 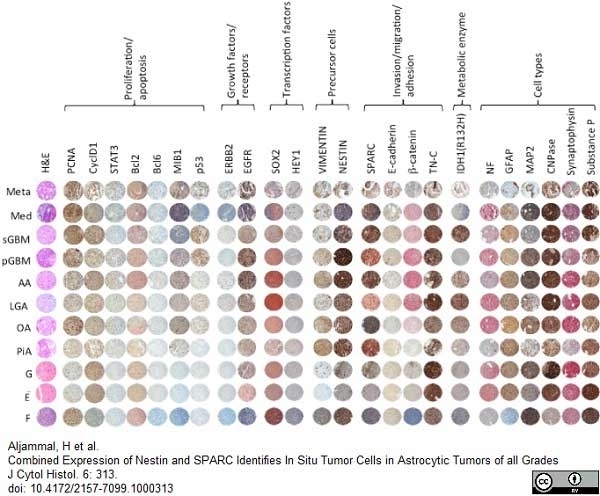 Overview of representative punches of control and tumor tissue samples stained with Hematoxylin/Eosin (H/E) or immunostained for the 24 specific proteins grouped by categories. 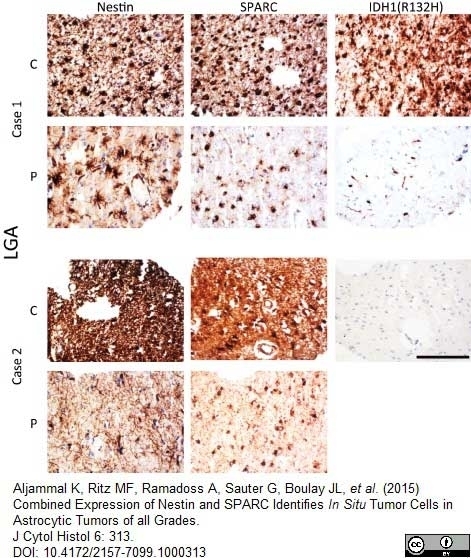 Combined Expression of Nestin and SPARC Identifies In Situ Tumor Cells in Astrocytic Tumors of all Grades. Representative micrographs of fetal, epileptic and gliotic tissues immunostained for nestin, SPARC and IDH1(R132H). IDH1(R132H) was not expressed in these control brain samples, whereas nestin was highly expressed in fetal tissue, not in epilepsy (except one single cell shown in inlet), but was present in reactive glial cells in gliotic tissue (black arrows) and in microvessels (white arrows). SPARC was expressed in reactive glial cells in gliotic tissue (black arrows), as well as in rare cells in epileptic tissue (black arrows), in addition to some vascular cells (white arrows). Original magnification x400. Scale bar: 100 μm. Representative micrographs of two cases of low grade astrocytomas immunostained for nestin, SPARC and IDH1(R132H). Case 1 expressed the mutated IDH1 protein, whereas case 2 was clearly IDH1(R132H)-negative. Both cases were nestin and SPARC immunopositive. The center (c) and periphery (p) of the corresponding tumors are depicted for each case. Original magnification x400. Scale bar: 100 μm. From: Aljammal K, Ritz MF, Ramadoss A, Sauter G, Boulay JL, et al. 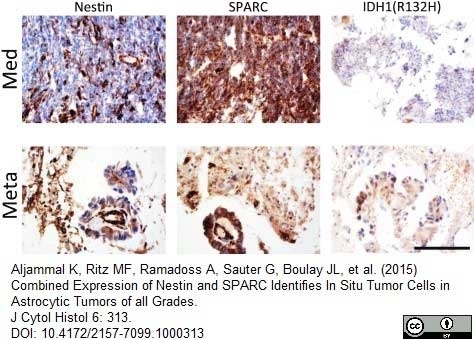 (2015) Combined Expression of Nestin and SPARC Identifies In Situ Tumor Cells in Astrocytic Tumors of all Grades. Representative micrographs of two cases of anaplastic astrocytoma immunostained for nestin, SPARC and IDH1(R132H). Case 1 was positive for all three markers, whereas case 2 was IDH1(R132H) negative and low for SPARC expression. For both cases, the center (c) and periphery (p) of the tumors are depicted. Original magnification x400. Scale bar: 100 μm. 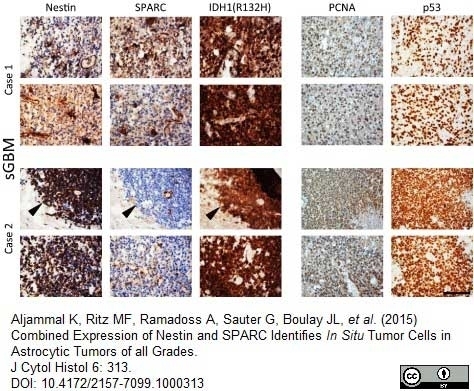 Representative micrographs of tumors in pGBM and sGBM immunostained for nestin, SPARC and IDH1(R132H). The case of sGBM was positive for all three markers, whereas pGBM was IDH1(R132H) negative. The center (c) and periphery (p) of the tumors are shown. Original magnification x400. Scale bar: 100 μm. Representative micrographs of the tumor centers of two cases of sGBM with low SPARC immunostaining. The two cases (case 1 and 2) showed high cellularity, with strong nuclear expression of PCNA and p53 in almost all cells, in addition to the expression of IDH1(R132H). 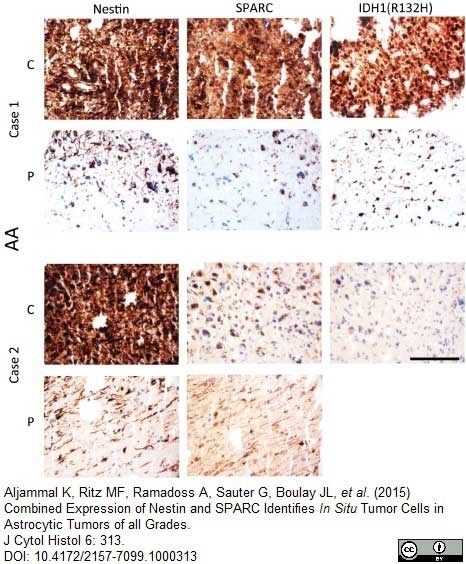 Case 1 showed low number of nestin-positive cells, whereas case 2 revealed strong nestin immunostaining in all cells at the “hot spots” indicated by black arrowheads. Original magnification x400. Scale bar: 100 μm. 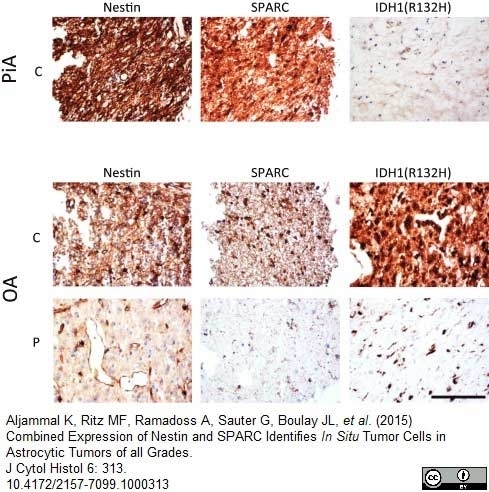 Representative micrographs of medulloblastoma and metastasis immunostained for nestin, SPARC and IDH1(R132H). 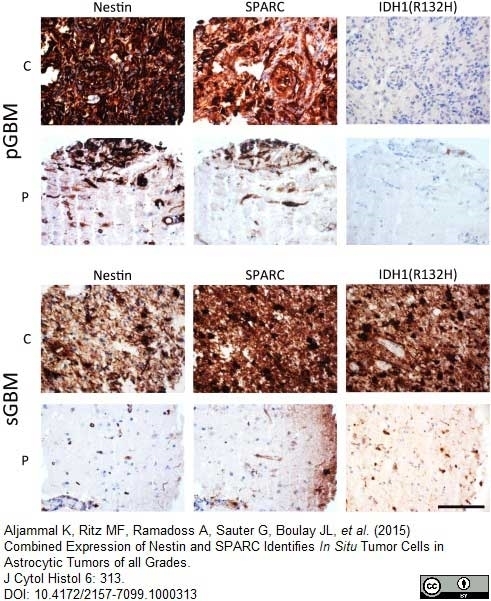 Nestin was mainly observed expressed by tumor vasculature and some rare tumor cells. 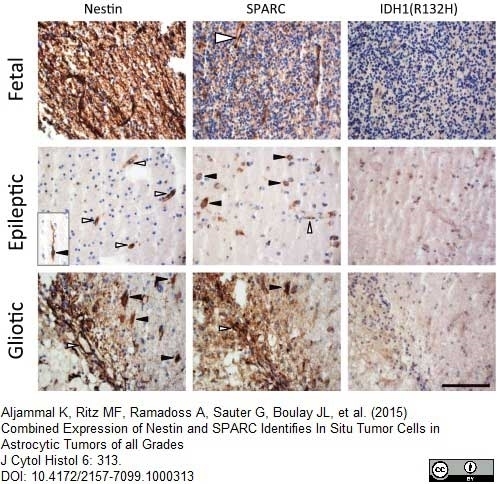 SPARC expression was strong in medulloblastoma cells and the cells constituting the rosette in the metastasis. No IDH1(R132H) staining was observed in these two cases. Original magnification x400. Scale bar: 100 μm. Suggested positive control: WI-38 (ATCC# CCL75) or U251 cell lysate. J Comp Neurol. 511: 557-80. González-Garza, M.T. et al. (2013) Differentiation of CD133+ stem cells from amyotrophic lateral sclerosis patients into preneuron cells. Stem Cells Transl Med. 2 (2): 129-35. Sterlacci, W. et al. (2014) Putative stem cell markers in non-small-cell lung cancer: a clinicopathologic characterization. J Thorac Oncol. 9 (1): 41-9. Nowak, A. et al. (2017) Nestin-positive microvessel density is an independent prognostic factor in breast cancer. Arranz, L. et al. (2014) Neuropathy of haematopoietic stem cell niche is essential for myeloproliferative neoplasms. Del Toro, R. et al. (2016) Nestin(+) cells direct inflammatory cell migration in atherosclerosis.